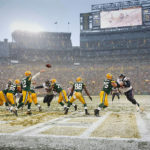 The Green Bay Packers have been on a roll the last two week in two consecutive home games at Lambeau Field in Green bay, Wisconsin. In those two weeks they have outscored their opponents 108-34. 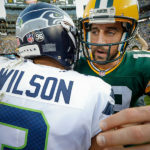 As a sports photographer it’s always exciting to photograph a high scoring game, but it has gotten a little boring in the fourth quarter of those games with the Packers ahead with a demand lead. 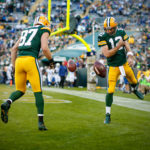 This week the Packers defeated the Philadelphia Eagles 53-20 in a game that not only did the offense score, but special teams also scored with a punt return and the defense scored two touchdowns. I had two of the big non offensive scores come right in to my lap with Julius Peppers interception for a touchdown and Micah Hyde’s punt return for touchdown. 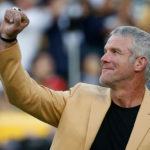 The Packers play the Minnesota Viking on the road this weekend before taking on another hot NFL team, the New England Patriots. 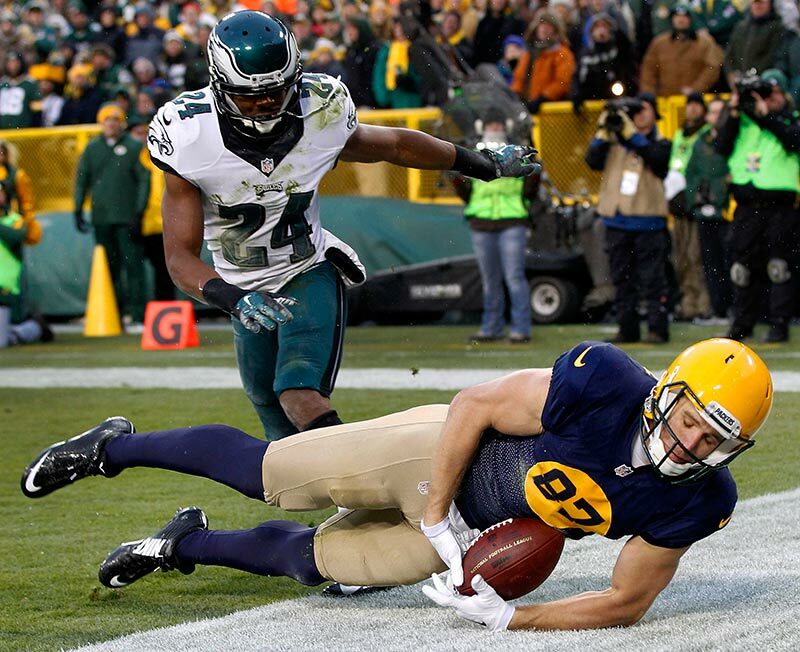 Green Bay Packers wide receiver Jordy Nelson tires to pull in a pass in the end zone as Philadelphia Eagles cornerback Bradley Fletcher defends. 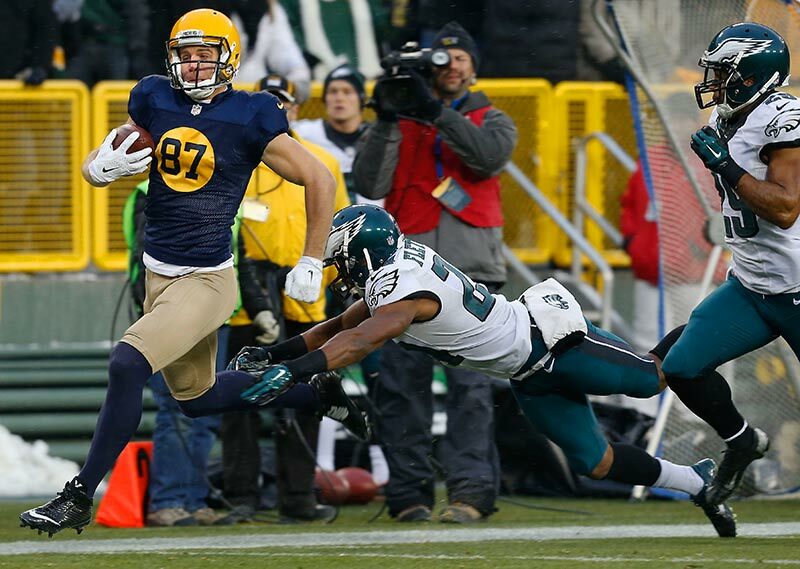 Philadelphia Eagles cornerback Bradley Fletcher tries to stop Green Bay Packers wide receiver Jordy Nelson. 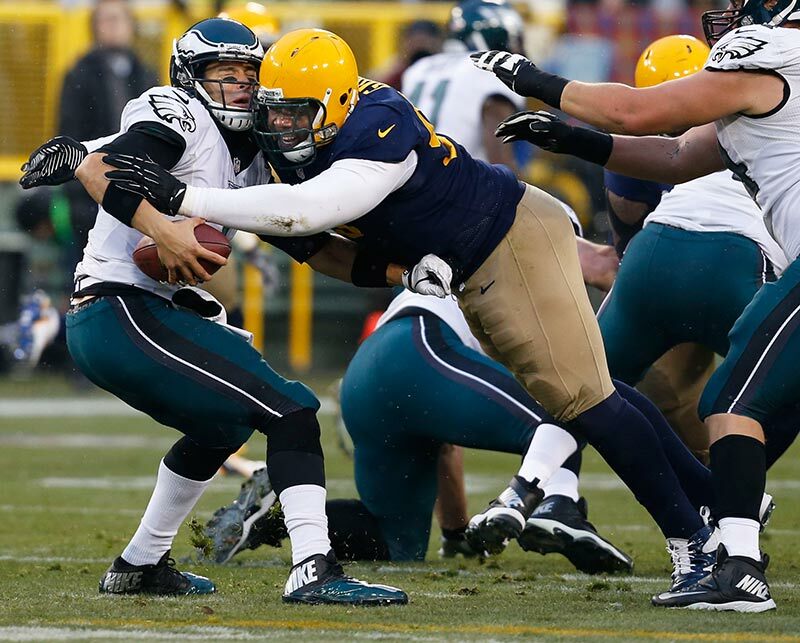 Green Bay Packers nose tackle Letroy Guion sacks Philadelphia Eagles quarterback Mark Sanchez. 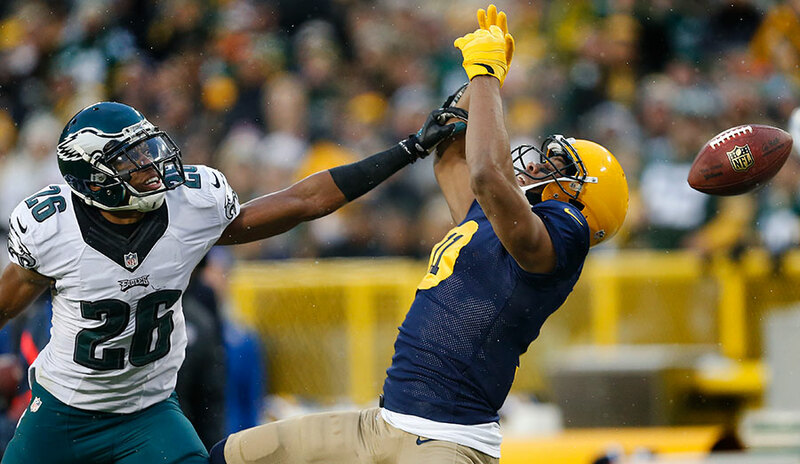 Philadelphia Eagles cornerback Cary Williams breaks up a pass intended for Green Bay Packers wide receiver Jarrett Boykin. Green Bay Packers free safety Micah Hyde returns a punt for a touchdown. Green Bay Packers free safety Micah Hyde celebrates his punt return touchdown with a Lambeau Leap. Philadelphia Eagles free safety Malcolm Jenkins upends Green Bay Packers running back Eddie Lacy. 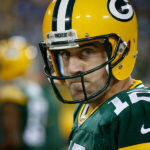 Green Bay Packers quarterback Aaron Rodgers watches a fumble on a sack get away from him before getting picked up by Packers Richard Rodgers. Philadelphia Eagles cornerback Bradley Fletcher breaks up a pass intended for Green Bay Packers wide receiver Jordy Nelson. Green Bay Packers quarterback Aaron Rodgers throws a pass to Randall Cobb. Green Bay Packers outside linebacker Julius Peppers fends off Philadelphia Eagles wide receiver Jordan Matthews as he returns an interception for a touchdown. Green Bay Packers running back Eddie Lacy runs aways form the Philadelphia Eagles defense. Green Bay Packers quarterback Aaron Rodgers celebrates a catch and run by Eddie Lacy for a touchdown. Green Bay Packers cornerback Tramon Williams intercepts a pass intended for Philadelphia Eagles wide receiver Jeremy Maclin. 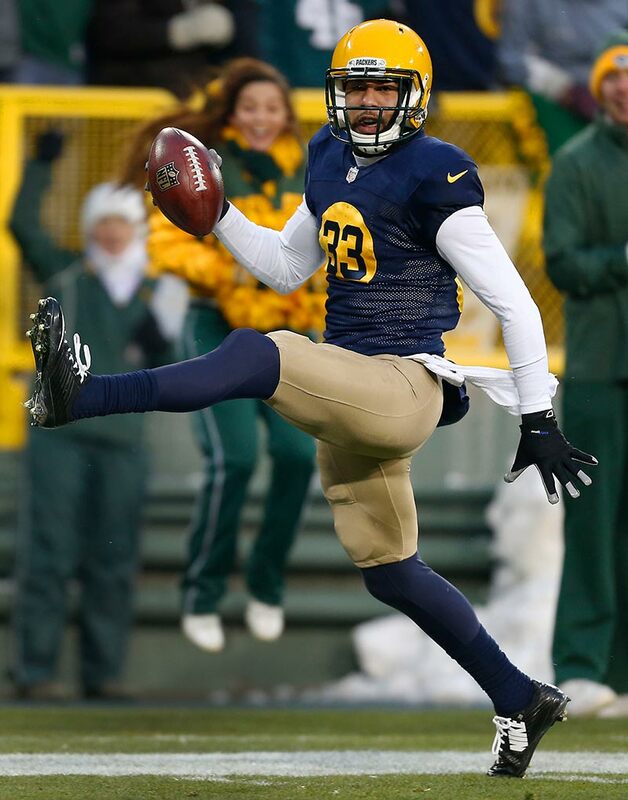 Green Bay Packers cornerback Tramon Williams celebrates his interception with free safety Micah Hyde. Green Bay Packers running back Eddie Lacy celebrates as he walks off the field. Green Bay Packers outside linebacker Julius Peppers high fives fans as he runs off the field.